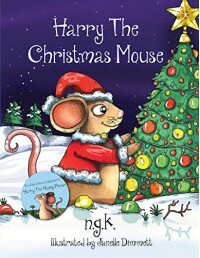 Harry The Christmas Mouse by N K (Author) with Janelle Dimmett (Illustrator) is a children's book for ages two to five. It is filled with characters helping Santa on Christmas Eve. I gave it four stars. "Harry set off on his short winter walk. A bit cold for a chat, a bit cold for a talk! 'But wait!' said Harry. 'Whatever is that? A sleigh and a man with a very red hat!'" I received a complimentary Kindle copy of in an Amazon promotion. That did not change my opinion for this review.